HolyJuan: The Department of Homeland Security: What are they researching on the internet? 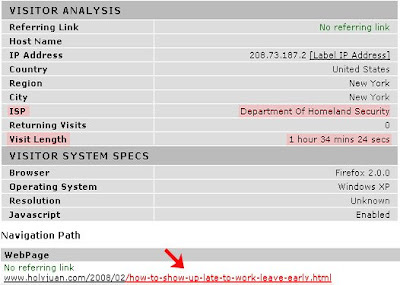 The Department of Homeland Security: What are they researching on the internet? slackerdom is the new terrorism, I guess. You're either here 9-5, or you're against us. I think you mare making this more than it is. Michael Chertoff is merely wanting to figure how he can come in late and not have Cheney bust his balls.